The lovely seaside town of Conwy has recently been voted as the prettiest place in the UK to visit, by the Japanese Association of Travel Agents. They questioned 300 professionals from the leading travel agencies, in Japan, to choose the 30 most attractive villages in Europe. Conwy was voted number one, not only in Europe but also the only finalist in the UK. As a result of this, Conwy is now being promoted throughout Japan as a tourist attraction at tourism conferences and expositions. We may well see an increase in Japanese holidaymakers and the occaional Welsh Sushi Dish at static caravan parks in North Wales. Since receiving this award, Visit Conwy has had a specially made recipe for sushi developed, known locally as “Wushi”. The Chairman of the Destination Conwy Steering Group stated that they hope it will encourage locals and visitors to the area to try Welsh ingredients in this alternative way, to celebrate The Year of Adventure in Wales. 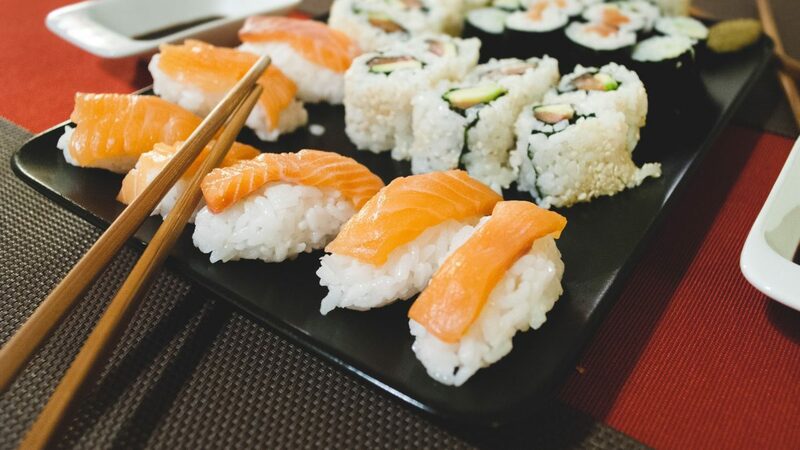 The traditional, raw fish Eastern dish from Japan has been given a Welsh twist, created using fine Welsh ingredients including cockles, leeks, Welsh cheddar cheese and a sea trout known as sewin. Tasty morsels, these delicate parcels of food have then been wrapped in traditional black laverbread which is made from seaweed. Created with the help of Hisae Driver, the Head Chef at a local pan Asian restaurant East, in Llandudno it is predicted that the new Wushi dish will grab attention and become a local delicacy. If you are not a great fan of Asian or Japanese food, there are plenty of alternatives for you to try in the North Wales region. Some famous, traditional recipes like Welsh Rarebit or Glamorgan vegetarian sausages combined with the modern Welsh cooking, using meat from Welsh lambs; black beef and Carmarthen ham which uses top quality, fresh produce. The aim of the dishes is to cook simply and allow the natural flavours and freshness of the food shine through. This foody delight is set in the heart of the Conwy Valley, a centre of excellence for showcasing the finest foods sourced from the Bodnant Estate and other Welsh, award-winning suppliers. Offering its own Bakery, Delicatessen and Butchers shop you can buy award winning cakes, homemade pies and artisan bread. You can also visit the Bodnant Dairy, and see traditional Welsh cheeses being handmade on site. The Hayloft Restaurant at Bodnant offers diners the chance to sample superb, Welsh cuisine; or to pay a visit to the restored 18th century Furnace Tearooms and partake in an afternoon tea experience. If you are contemplating trying out the new Wushi food, or any of the other Welsh foody delights, why not think about owning a holiday home on one of the many static caravan parks in North Wales. If you like the idea of a rural retreat close to Conwy you could invest in a luxury holiday lodge at Sirior Bach Caravan Park. Whatever your family requirements we have several options available to buy, from Luxury Lodges to Static Caravans for you to view and choose from. Contact us today for further information.